Size: Adult - 1/4 to 1/2"
Identification: Large compared with other Texas ants. Black, reddish brown, or yellowish. May be winged or wingless. Only males and queens have wings. Workers are large infertile females. Thorax in profile is evenly rounded on top. Circle of tiny hairs on the rear end. Red head and thorax, black abdomen. Organic control: Boric acid products indoors; plant oil products, diatomaceous earth, beneficial nematodes. 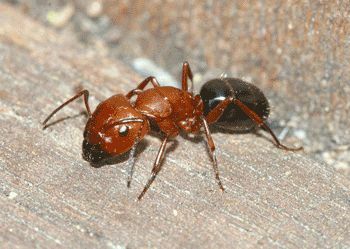 Acrobat ants and odorous ants are controlled with the same techniques. Almond oil works well to repel them and is especially good for treating wood. Insight: May give you a threatening bite but does not hurt. They do not sting. About the only way to find them is to listen to the walls at night. Where discovered, drill a small hole and dust pyrethrum or boric acid into the wall to kill them. Ants are said to be the most abundant terrestrial animals. Wood eating ants that can be controlled with boric acid wood treatments or dusting indoors. Wall cavities can be treated with a mix of 90% natural diatomaceous earth and 10% boric acid. Carpenter ants are not a problem for trees. They are only carving out living quarters in dead and decaying wood. They don't eat or attack in any way the living tree tissue. They can possible be run off with garlic tea or garlic-pepper tea spray but it's probably not worth the trouble. If they start to tunnel into the deed wood in your house (studs, rafters, etc. ), treat with boric acid products or hire a pest control company that uses the same or the low toxicity baits.